Invasive Candidiasis (IC) poses a major public health problem worldwide. Despite the introduction of new antifungal agents and changes in clinical practices, its morbidity and mortality rates and healthcare costs remain persistently high. This is mainly because of the serious underlying conditions of infected patients (critically ill or severely immunocompromised patients) and the difficulties encountered in early diagnosing this opportunistic mycosis and initiating prompt and appropriate antifungal therapy. In the light of this great clinical challenge, the past decades have witnessed the development of diverse early detection and therapeutic intervention strategies aimed at minimizing the clinical impact and economic burden of this healthcare-associated infection caused by Candida species. Here, we review the currently available methods for IC diagnosis. These encompass (i) gold standard methods (fungal culture and tissue histopathology), (ii) pathogen-derived biomarker detection tests (PCR, protein antigens, mannan, ß-D-glucan and D-arabinitol-based assays), (iii) host-derived biomarker detection tests (Candida albicans germ tube antibodies or CAGTA, anti-mannan antibodies, other infection-specific antibodies, procalcitonin, serum amyloid A, interleukin 17, interleukin 23 and transforming growth factor ß-based assays), (iv) clinical prediction algorithms (Candida score, Candida colonization index and other prediction rules), and (v) leading-edge molecular, proteomic and immunomic technologies (such as peptide nucleic acid-fluorescent in situ hybridization or PNA-FISH, T2 magnetic resonance or T2Candida assay, and matrix-assisted laser desorption/ionization time-of-flight mass spectrometry or MALDI-TOF MS, among others). Their strengths, utility, limitations as well as combined use to assist in the diagnosis of this life-threatening and costly fungal infection (including candidemia and deepseated candidiasis) are also discussed. Keywords: Diagnosis, Invasive candidiasis, Candidemia, β-D-glucan, Candida score, PNA-FISH, T2 Candida, MALDI-TOF. 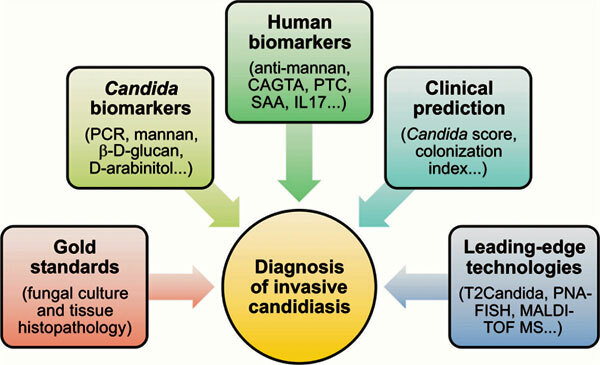 Keywords:Diagnosis, Invasive candidiasis, Candidemia, β-D-glucan, Candida score, PNA-FISH, T2 Candida, MALDI-TOF. Abstract:Invasive Candidiasis (IC) poses a major public health problem worldwide. Despite the introduction of new antifungal agents and changes in clinical practices, its morbidity and mortality rates and healthcare costs remain persistently high. This is mainly because of the serious underlying conditions of infected patients (critically ill or severely immunocompromised patients) and the difficulties encountered in early diagnosing this opportunistic mycosis and initiating prompt and appropriate antifungal therapy. In the light of this great clinical challenge, the past decades have witnessed the development of diverse early detection and therapeutic intervention strategies aimed at minimizing the clinical impact and economic burden of this healthcare-associated infection caused by Candida species. Here, we review the currently available methods for IC diagnosis. These encompass (i) gold standard methods (fungal culture and tissue histopathology), (ii) pathogen-derived biomarker detection tests (PCR, protein antigens, mannan, ß-D-glucan and D-arabinitol-based assays), (iii) host-derived biomarker detection tests (Candida albicans germ tube antibodies or CAGTA, anti-mannan antibodies, other infection-specific antibodies, procalcitonin, serum amyloid A, interleukin 17, interleukin 23 and transforming growth factor ß-based assays), (iv) clinical prediction algorithms (Candida score, Candida colonization index and other prediction rules), and (v) leading-edge molecular, proteomic and immunomic technologies (such as peptide nucleic acid-fluorescent in situ hybridization or PNA-FISH, T2 magnetic resonance or T2Candida assay, and matrix-assisted laser desorption/ionization time-of-flight mass spectrometry or MALDI-TOF MS, among others). Their strengths, utility, limitations as well as combined use to assist in the diagnosis of this life-threatening and costly fungal infection (including candidemia and deepseated candidiasis) are also discussed.